At Sports Information Services (SIS), we transmit in excess of 620,000 hours of live sports content every year to countries as far away as Sri Lanka and the Caribbean, from more than 18 linear satellite and OTT channels; all from studios in Milton Keynes and Manchester. For us, the latency from live event to customer screen is the most important factor in everything we do. Milliseconds count because any delay means the integrity of our content can be in jeopardy. Not only that, consumers can gain unfair advantages if they bet on content before it arrives in a retail outlet or online. Satellite technology has served a great purpose in delivering content from around the world, however it does add unwanted delays to proceedings. 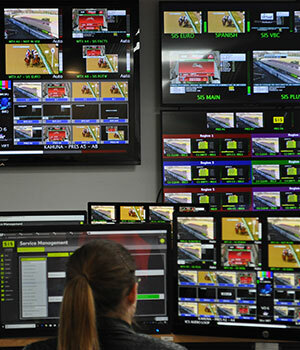 In previous times, we sent satellite trucks using MPEG2 encoding in order to deliver live pictures from race courses and greyhound tracks, as the high cost of bandwidth meant it was one of only a few available codecs. However, this is all changing. Using Jpeg2000 encoding/decoding from on-course using a direct fibre connection keeps the latency down below 200 milliseconds. Plus, taking that content in as 1080P means that the quality of streaming isn’t compromised. Progressive scan was chosen for our new SIS Greyhound Service to ensure that slow motion replays did not suffer from the judder associated with interlace scan. It all adds for a better end product for our customers, and let’s not forget, the customer is the most important person in any business. Although low latency and high-quality content does benefit the customer, ultimately it does come at a cost. As a result, SIS has been focusing on automating a great deal of its broadcast operations to reduce overheads and provide a cost-effective solution to our customers. Our linear channels have a very similar feel to rolling news channels, where each hour is split into repeatable sections of content which can be pre-planned and scheduled. As such, we tap into some of the automation principles which have been used across the TV News industry for many years. Traditional back-end broadcast equipment such as vision mixers, sound desks and graphics machines, are now triggered by data, rather than an operator. This automation system is built in house, which gives us greater flexibility when it comes to adapting to customer requests and changes. It means our resources move from operators to programmers, but still keeping the editorial control required, and the quality of our channels is not compromised. When it comes to technology we don’t like single points of failure. As with any live broadcaster, resilience is paramount and any disruption to our services is not tolerated. The IT principles of 99.99% up time is irrelevant, as broadcasters are looking for 100% up time. This is a key difference in mentality between broadcast engineers and IT engineers, and will need to be tackled as we start to share more and more technologies. Where possible, redundant paths and systems are installed with automatic switch over should video or audio loss occur. We also ensure we work with broadcast partners who can provide robust hardware and quick turnaround of spares. Over the past five years, there has been a noticeable increase in companies offering prosumer equipment to the broadcast market. You only need to walk around trade shows such as IBC or NAB to see that one of the largest stands is usually taken up by one of these companies. It’s an area that we have experimented in, but we found that the return on investment is not there. The old proverb of ‘buy cheap, buy twice’ is very much relevant. So, what does the future hold for video technology in the betting industry? What we can be sure of, is that any developments will be led by customer demand, as ultimately, they want super quick turnaround from new idea, to delivery on their TVs/screens. One area that we’re particularly excited about is cloud technology and believe it will be a real game changer for us and our customers. Within the broadcast industry, the typical 6-8 weeks lead time on hardware, which then needs installing, commissioning, and testing, is too long. The speed of delivery if we simply spin up another instance in the cloud, will mean we can really start to deliver solutions in days, rather than months. There are still some individuals that are yet to be convinced that the use of the cloud is achievable with live broadcast video. However, we have seen several early stage demonstrations of the use of cloud technology, and it performs very well. There are challenges, but as is always the case when embracing new technologies, there’s always a solution to overcome such hurdles. For instance, who would have thought even 15 years ago that we would be using an off the shelf PC to drive a vision mixer, or put graphics to air via an SDI PCIe card. These things became a reality, and so will live broadcast production in the cloud. The challenge for the betting industry is getting the latency down to acceptable levels. Above all, it is innovation of technological solutions which sets us apart from our competitors. Ensuring broadcast solutions are not over engineered, but also giving the customer exactly what they want for the best possible cost, is a key factor.